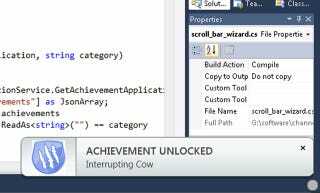 Taking the notion of institutionalised rewards maybe a little bit too far, Microsoft has begun awarding achievements to developers. Earlier today the company unveiled a beta plug-in for the Microsoft's Visual Studio development environment, which offers 32 achievements for developers based on how well they're coding. There are even leaderboards, and the achievements can be linked to a Facebook page.